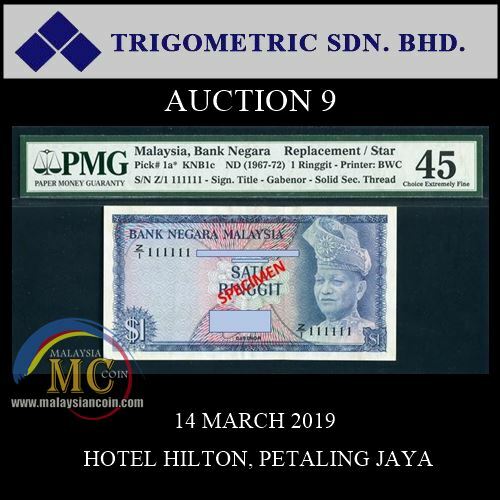 A 1st series Replacement 1 Ringgit with a Solid Number prefix Z/1 111111 signed by Ismail Ali with graded PMG 45 is one of the super rare banknote in the upcoming Trigometric Auction 9, 14 March 2019. 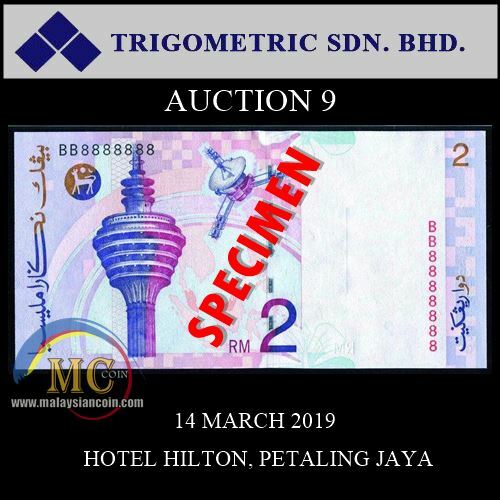 Trigo Auction 9 will be held at Serunai Suite, Hilton Hotel Petaling Jaya. A Solid Number Replacement 1st series Malaysia banknote is one of the things in Malaysian numismatic that you don't see everyday in Auction. Bidding price for lot 9391 start at RM8,000 and maximum estimate price is RM20,000. The main highlight of the auction is a 2 Ringgit 8th Series Ahmad Don Solid's BB Number Sets, Prefix BB Set is one of the hardest sets to accumulate. The set consist of a BB0000001-0000010, BB1111111-BB9999999 & BB1234567 (20pcs) RM2 1996. This set has never been auctioned and believed to be the only set since the introduction of Malaysia Ringgit. Gradeda by PMG 64EPQ-67EPQ. The BB Number set (lot 9405) estimate to sell for RM80,000-RM190,000. Another highlight of the auction is a $100 Deutsch-Asiatische Bank dated 1 July 1914, Peking (P S277), S/no. 01296 UNC. Deutsch-Asiatische Bank (DAB) was a foreign bank in China. DAB was founded in Shanghai in 1889 with the participation of Deutsche Bank, one of the largest banks in Germany. In 1906, it received the concession to issue its own banknotes in China. During First World War and the Second World War, its branch network and business activities were destroyed. 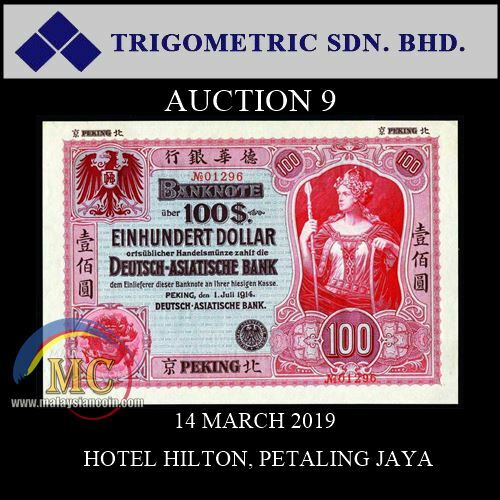 The $100 Deutsch-Asiatische Bank dated 1 July 1914 (Lot 9096A) estimate to sell for RM50,000-RM90,000. Lot viewing will be held on 12 and 13 March 2019 from 11.00am until 5.00pm at Trigometric shop, level 3, Amcorp Mall, Petaling Jaya. Online bidding for Trigometric Auction 9 is now live at LiveAuctioneers.com. Buyer premium is 15% for floor bid and 20% for liveauctioneers.com internet bidding. You can pay using cash or credit card but the charges for credit card is 3%. For further information, you can contact Trigometric Sdn Bhd (Mr. Koay / MS Farah) at 03-7957 9566 or you can visit them at Amcorp Mall Petaling Jaya (Open everyday 10am – 6pm, except Monday and Public Holiday). You can download Auction Catalogue at Trigometric website TheTrigo.org.